Princes Nourah University Life Support Center providing training to Fitness Time Gymnasium staff in Saudi Arabia. A partially blind woman not only learned what to do if someone is choking, drowning or in cardiac arrest, she used them to save her sister. An airport staffer learned how to use an AED and, soon after, used the device to save a passenger whose heart had stopped. Then there was the 13-year-old student who learned the Heimlich maneuver at school. On a school day soon after, he used it to save a fellow student. A video shows him pulling off this feat as if it was no big deal, even though it proved to be big enough to earn a visit with the Prince of Riyadh. Yes, Riyadh, the capital and most populated city in Saudi Arabia. I’m proud to say that my organization, the American Heart Association, has been a driving force in teaching the skills needed to respond to emergencies beyond healthcare professionals and into communities. And the driving force behind the AHA’s work is Zehra’ Al-Hilali, our MENA Regional Director in this part of the world. As with many new concepts, it took a few years to get rolling. By the third year, 2016, things started to click. In 2017, training numbers took off and a key milestone was reached: the first lifesaving event known to be traced to these programs. This year, the numbers took off again, with more than 147,000 people learning Hands-Only CPR skills across 12 countries. Among those new trainees were the trio of lifesavers in the anecdotes atop this story. Looking out for one another is a basic element of humanity, crossing countries, cultures and colors. Seeing people embrace the opportunity to learn these basic lifesaving skills, and then seeing them put those skills to use, is inspirational and instructional. Here’s how it happened. In the early 2000s, the population zoomed in the Gulf Countries: United Arab Emirates, Saudi Arabia, Qatar, Bahrain, Kuwait and Oman. That created a need for more healthcare providers and first responders. Certification for many of those roles required training in Basic Life Support, which the AHA provides. We began opening training centers across the region and, in 2011, opened a regional office in Dubai. From the start, people asked for the training to stretch beyond the healthcare world. They wanted the kinds of health fairs Americans are accustomed to seeing at schools, hospitals and malls; at parks, community centers and places of worship. It was too soon, though. These training centers needed to focus on professionals, and on training more trainers. By late 2013, our regional director believed it was time to start branching out. If you see a teen or adult collapse, call for help (in the United States, this means calling 911). Push hard and fast in the center of their chest, preferably to the beat of the classic disco song “Stayin’ Alive” until help arrives. In 2015, the program widened, with roughly 6,000 people learning Hands-Only CPR. In 2016, the impact more than doubled, as upwards of 13,000 people received training. The big takeaway, however, went beyond the numbers. It was the exposure. Interest grew in both Hands-Only CPR training, as well as Heartsaver and Basic Life Support classes. “We learned that we need to do more, we need to continue this,” Zehra’ said. Looking ahead for 2017, Zehra’ noticed a conflict. The holy month of Ramadan was beginning the last week of May, essentially cutting several days from their campaign. Thinking more about the timing, she realized May wasn’t ideal anyway. The region’s oppressive heat is kicking in by then, melting plans for outdoor events, and schools had final exams, making it difficult for them to host events. So Heartsaver Month was shifted to March. The team also set an ambitious goal of again nearly doubling their total number of trainees, seeking to reach 25,000 people. It worked, further establishing this event’s significance in the region. People looked forward to it. Hospitals and schools were enjoying playing host. Friendly competitions sprang up to see which could train the most people. “We have this saying that a positive attitude is contagious,” Zehra’ said. The new timing helped, too. In addition to avoiding the May conflicts, there also was an overlap with International Women’s Day on March 8. Many centers used that as a promotional tie-in. “Women brought children to events. There were so many great photos. And the weather was nice!” Zehra’ said. Best of all was notching the first known “save” by a trainee. A corporal in the Dubai police force monitoring road surveillance cameras recognized that someone was having a heart attack. He could tell, he said, because of what he’d learned about in training. So he dispatched a patrol car and an ambulance; help arrived in time to save the person’s life. The officer received an AHA Heartsaver Hero award in a ceremony at the Dubai International Airport, drawing more publicity. Dubai Police Corporal Mohammed Dabos receives the first UAE Heartsaver Hero Award from Kelly Griesenbeck, AHA’s international marketing director. Further recognition of the campaign’s progress came with recognition from the World Health Organization and the NCD Alliance, a network of more than 2,000 organizations in 170 countries that is dedicated to preventing and controlling non-communicable diseases. The 2017 handbook of case studies in the Eastern Mediterranean Region included two pages about the success of the annual Heartsaver Month. With momentum building, the bar was set even higher for 2018. Yet nowhere near high enough. The target of 30,000 trainees was exceeded by a single center. Two centers, actually. 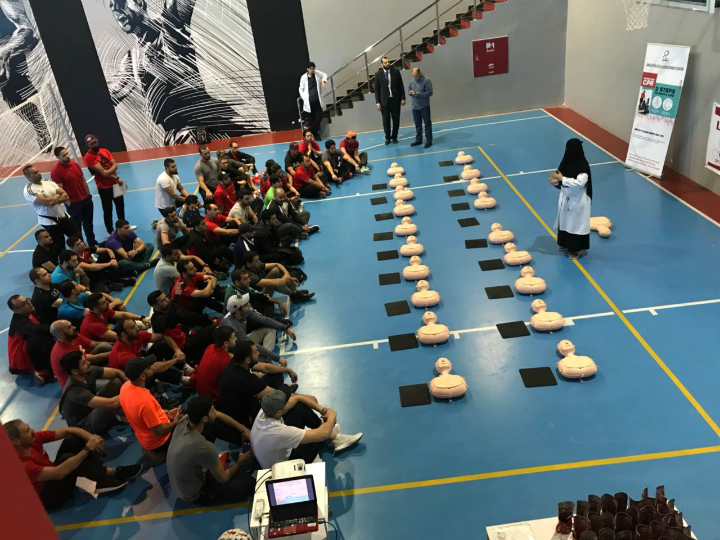 More than 77,000 people were taught Hands-Only CPR in Saudi Arabia alone. All told, the tally reached 147,859, exceeding the combined total of the program’s history! A boy began choking after accidentally swallowing the plastic lid of a water bottle. An adult tried to help, but it was a 13-year-old student who rushed in and provided the Heimlich maneuver to jar the blockage. Two training sessions had been held at the school, teaching both Hands-Only CPR and how to handle a choking incident. In addition to the lifesaver being honored by the prince, officials announced on national TV that they will be pushing to include more first aid training in schools. One of the visually impaired trainees saved her sister from choking. A volunteer at a deaf school saved a deaf student who was choking. A traveler who went into cardiac arrest upon arrived at the Dubai airport was saved by an airport staffer who knew exactly what to do, calling for help and starting CPR. Days later, the airport employee visited the man as he recovered in the hospital. “I didn’t know the man who saved my life until I met him this morning, and now I will never forget his face,” the survivor said. “I feel immense gratitude. Saad Al-Hojaili, Al-Madinah Training Director, is honored for his work with people with special needs. Next to him are Zehra’ Al-Hilali, AHA’s MENA regional director, and Michael Hulley, AHA’s international vice president. Zehra’ presents a certificate honoring the working team at King Saud University’s Clinical Skills and Simulation Center. Their friendly rival, Prince Sultan Bin Abdulaziz College for EMS at KSU, gave out a trophy for the team that reached the most people. Hospitals and universities posted fliers offering more training throughout the year. It’s become clear that holding a health care can draw large crowds regardless of whether it is Heartsaver Month. The campaign is a hit on social media, too. Audience numbers across all platforms continue to soar. More growth is coming, too. A Hands-Only CPR training video that’s already available in German, Italian, Japanese, Polish, Portuguese, Spanish and – most importantly for the MENA region – Arabic, will soon also be available in Urdo and Hindi. The translation is being done upon request from the Saudi Red Crescent Authority as a tribute to the success of our Heartsaver Month efforts, and to help the hundreds of thousands of people making a pilgrimage to Mecca this year. In whole, this is a feel-good story in every way. As Zehra’ said, a positive attitude is contagious. And it all started with hers. College for EMS at KSU team photo. CEO of the American Heart Association, the nation’s oldest and largest voluntary organization fighting cardiovascular diseases, including stroke.